Removing a bottom bracket that won't budge! I'm trying to remove the bottom bracket that came stock on my Surly LHT (it's dead after about 4,000 miles) and that darn thing is stuck. It's the right side that is stuck. I've tried everything from lightly tapping it with a rubber coated tool, to pouring boiling water on the outside to warm it/loosen it, but nothing has worked. Anyone have a suggestion before I take it to a shop and hope for the best? Are there any tools that screw into the BB so that you can get more torque without the bb tool slipping? Did you try the search function? If your BB tool has an open back end, get a bolt that matches the crank bolt threads, but is long enough to reach the spindle through the tool. Use that to fasten the tool into the BB cup, and then use a BF wrench to torque the cup out. I had a plastic NDS cup that wouldn't budge this week, and the teeth were all chewed up by the previous owner, so I wound up hacksawing it out. Good luck. Thanks demoncyclist for the good suggestion, that was my next step, I just didn't want to trek to Home Depot if I didn't have to. Hawaiiwrench- Yes, I tried the search function. The link "returned no results." I bRAD- thanks for the wonderful response that no doubt took some time away from working on your fixie, browsing used checkered Chuck Taylors at the thrift store, or trimming your "I'm more bike than you are," mechanic/and_or fixie beard. Last edited by fantom1; 04-04-09 at 08:42 AM. The Park Tool site has a good trick to secure the bb tool with a qr skewer (similar to demoncyclist's idea, i think) but you need a bb tool that can be turned with a wrench (six sided). With this method I was able to get enough torque to give myself a hernia, but luckily the cup gave in before I did. However, when I had the same problem using a hair dryer was the key. I know you tried boiling water, but I spent far too much elbow grease and wore down too many teeth on the cup before I used heat, so I wanna stress trying a heat gun (blow dryer) just in case. I'd bet there's a good chance that it was installed with a heat-activated locking compound. I can't find the thread but I had the same problem and someone recommended placing the tool in a vice and turning the frame. Worked great for me. You probably don't want to invest in an impact wrench unless you have other uses for it. I would try a cheater bar first and maybe a good hammer on that. But it is a workable option. I've done this. Ideally, the tool needs to be held onto the BB (long bolt, threaded rod, whatever), but the frame makes a nice, long cheater bar. Make sure the bench vice is secured to the bench, and that the bench is securely fastened to the wall. I watched a mechanic tip over a bench while attempting to remove a freewheel- there's no telling what straining on a stuck BB cup could do. Skewers and washer trick, or get that pedros bb tool holder. Use 12-15in adjustable wrench (every garage should have one), and if it still wont budge, get a breaker bar. I've only had one BB ever that resisted coming off with the traditional BB-tool. The bike had been dropped off a roof-rafter without wheels and the fall destroyed the fork and dented in the BB-shell really badly. My solution was this innovative clamping bolt by our famous Sheldon Brown. search titles> remove frozen bb bottom bracket??!! First tip i would give would be proper direction and leverage, on an English bb bike point the far(handle) end of the wrench towards the front axle as much as possible and push down. You can use a breaker bar(extend it as far towards the front of the bike as possible) but i usually just put the downtube/headtube juncture on my shoulder pushing the wrench down and away for stability(with the bike in a stand). Did you try it? Thanks for the compliment, but I'm not the one that can't get a bB out. I bRAD was only saying what many of us were thinking, it's easy to try to turn an English ds cup the wrong way if you aren't well versed in dealing with them or have a moment of brain fade. We've all done it. The bb tool can be clamped in place using a qr skewer if the bb spindle is hollow. Some square taper and all Octalink and ISIS bbs can be handled this way. 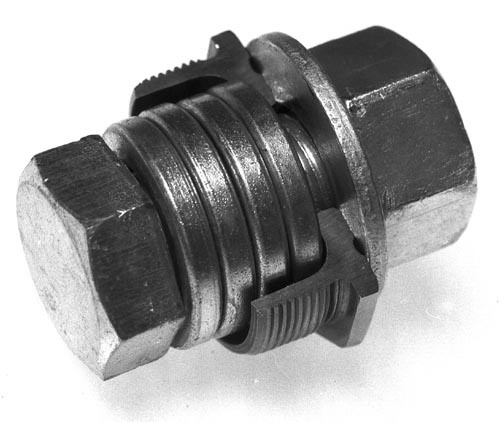 If it's a square taper bb and the spindle is not hollow, an M8x1.0 bolt about 40 to 50 mm long can be used through the bb tool and into the threads on the spindle to clamp the tool in place. Note the required bolt is a finer thread than the common M8x1.25 so it will be harder to find. The Sheldon Brown tool Danno showed is mainly for cup-and-cone bb's, not for cartridges, although it might work on some nds cartridge cups. Sweet, some good tips in here. I'm going to give them a shot. Thanks! Thanks HillRider! I just came across this thread while struggling with a stuck BB, and the M8x1.0 bolt was exactly what I needed. Well, that and a vise to hold the BB tool while I cranked on the frame.